This practical and decorative item, which can be used as a candle holder or a lamp, reproduces in larger-than-life size the striking shape of the sea urchin, made of carved glazed ceramic in bright bold colours. 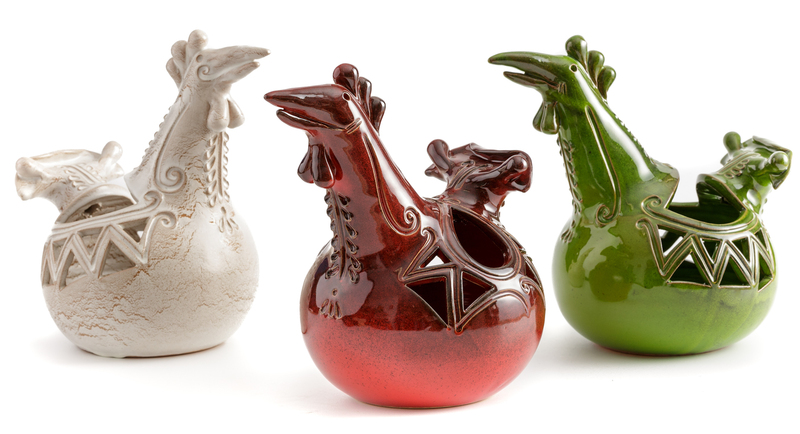 These moorhen-shaped glazed ceramic vases expressively reinterpret one of the main symbols of the local decorative tradition in an artistic manner. These handicrafts have carved decorations in the distinctive style of this ceramist and are available in three sizes and several colours. 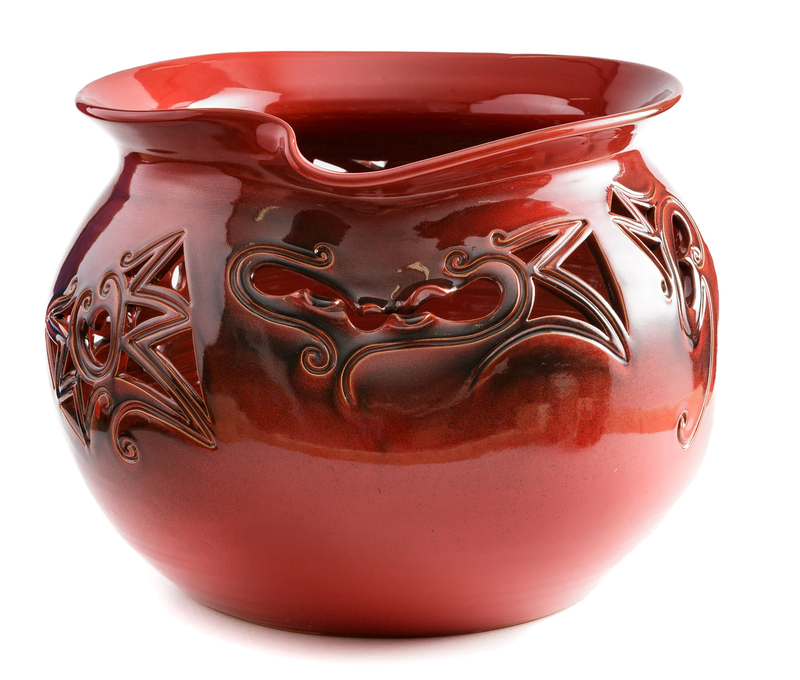 An outstanding glazed ceramic vase featuring elegantly carved decorations - a distinctive trait of this artisan - and the expressive strength of red, made even more intense by the vibrant shades used. Lathe-shaped, it is available in different sizes and decorations. 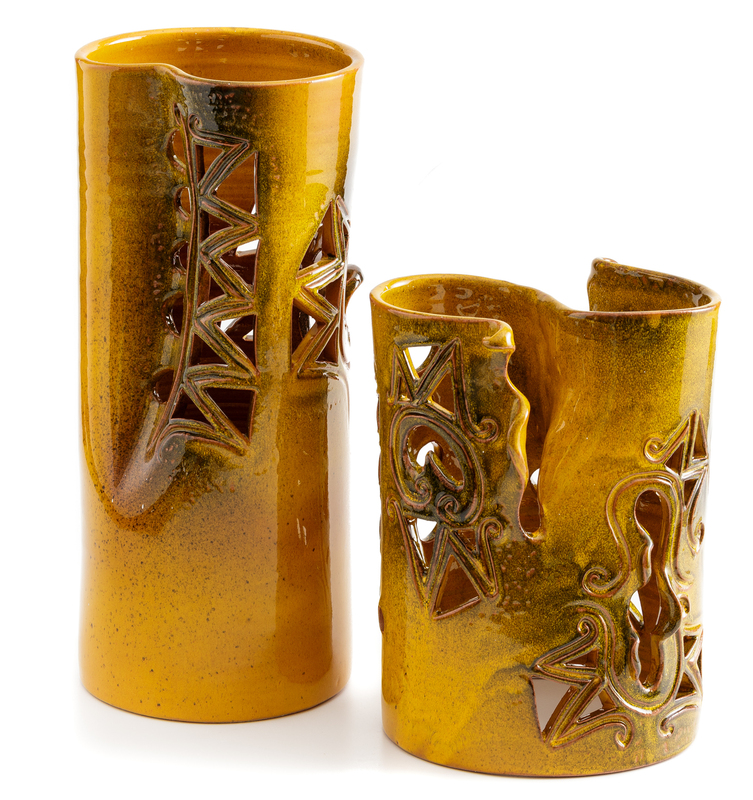 Genuine and artistic, these glazed ceramic vases have plastic shapes with cuts and perforations. Handcrafted as single pieces, they are available in three different sizes and various colours with unique manufacturing details. This exclusive centrepiece in glazed ceramic bears the distinctive style of this ceramist, featuring carved abstract shapes according to her personal expressive code. 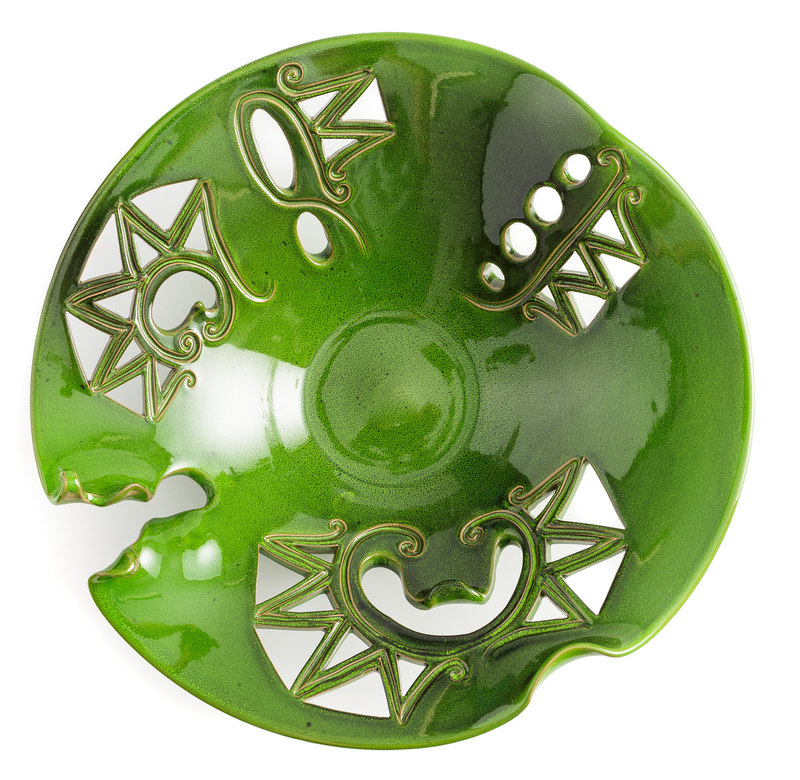 Available in various sizes and colours, this plate has a variety of artisanal finishing details. Roberta Casu, an imaginative and resourceful ceramist, explores with distinguished style and craftmanship subjects and inspirations that derive from the island tradition. Naturally gifted with artistic talent, which was evident from a very young age, Roberta studied to be an art teacher at the Art School of Oristano, renowned for a long tradition in ceramics, where she became familiar with the relevant techniques and started her highly rewarding stylistic research. Ceramics became her personal art form, so she carried out her apprenticeship at local artisans’ workshops up until 2001, when she set up her own workshop, La bottega d’arte, in her native town, Sanluri. She works tirelessly, crafting a wide range of ceramic accessories for the home, recognisable in style and in the perforated decorations, consisting of angels, Janas, moorhens and other traditional subjects. Definitely a go-ahead dynamic personality, Roberta, with the help of valued collaborators, works and sells her creations independently in her own sales outlet in the centre of Sanluri and actively promotes them in the main tourist and commercial localities across Sardinia. 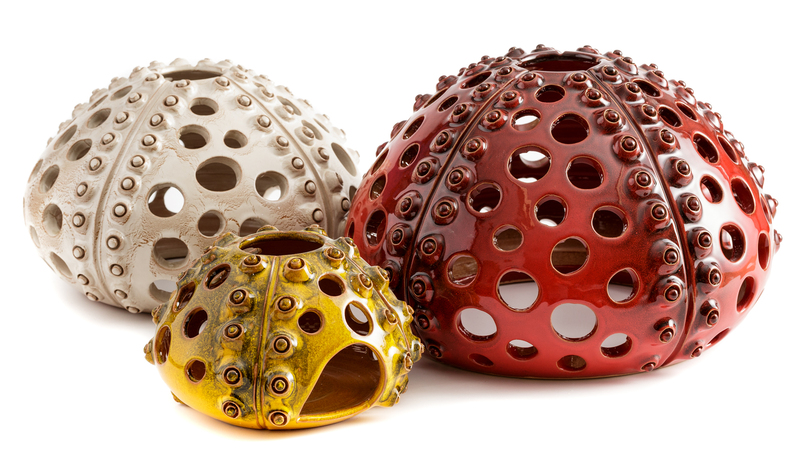 Roberta Casu’s artefacts include several lines of home décor items such as vases, lamps, appliques and centrepieces of various shapes and sizes featuring perforated decorations. Roberta depicts various subjects that range from the traditional gallinella – moorhen - to the sea urchin to the purely abstract form, made of polychrome glazed ceramic. Moreover, she also produces the much-loved Angeli (angels), Janas, Gnomi (gnomes) and Animaletti (small animals) lines, many different decorative sculptures, in their unmistakable style. Limited productions can also be commissioned. Several techniques are used in Roberta Casu’s workshop. Articrafts can be electrically lathe-shaped, plate-shaped using either a hydraulic press or a hydraulic rotating press. Objects are finished with plastic additions, perforated or engraved motifs decorated by means of slip, ceramic glazing or enamelling using a booth with an airbrush or a sprinkler.